The day before Xmas, I was browsing in a local shop called Ichiban Kan. It’s basically a Japanese version of the Dollar Store. At any rate, I found this little baby there for just $1.75. 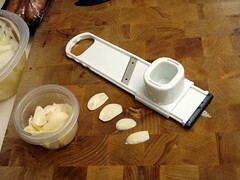 It’s absolutely fabulous for slicing garlic. I’ll probably find some other uses for it as well as time goes on, but even if I don’t, for the price, how could I resist? The garlic was part of the prep for a three-day cassoulet I’m working on. I’ll do a full blog post on that when it’s finished.